Filmed simultaneously with Browning’s production during the nighttime hours, using the same story line, same sets, same schedule and same budget (more or less), George Melford’s Spanish reflection of Tod Browning’s film is a curio in early talkie cinema. 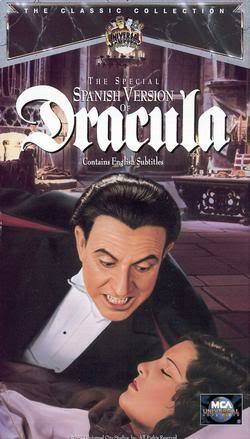 Not to say Spanish ‘Dracula’ doesn’t have some nice things to offer because it does, more than you’d think. This is virtually the same movie, yet also vastly different in so many weird, wonderful ways. While both versions are evidently tame by today’s standards, Melford’s version is a little more, shall we say, FORWARD. Given that this is a European production, the subtexts are not so subtle, the insinuations become a lot more obvious and the women area lot hotter for Dracula with the lower-cut dresses to prove it (though Hammer arguably perfected that). 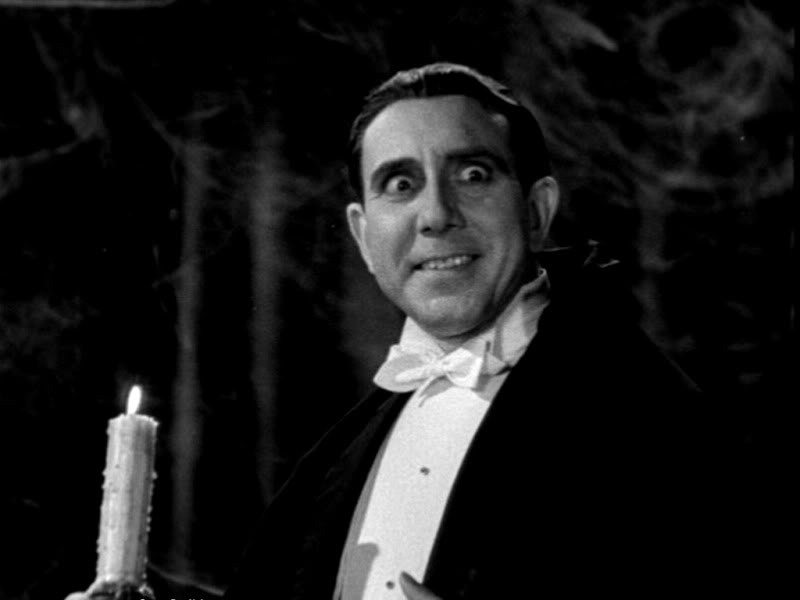 Everything about this movie is highly theatrical like Browning’s take, but while Lugosi played Dracula close to the vest which made the character a subtle yet charming menace, wild-eyed Carlos Villarias is the polar opposite. There is nothing about this guy that is NOT obvious. His mannerisms are grandiose, his cape flourishings are hard to miss and his wacky speeches stand out like a sore toe, it’s almost as if Villarias is competing with the actor playing Renfield (who is utterly energetic in his own brand of insanity) for Most Crazy Hombre. And yet, despite all of these painfully obvious hints that he is not normal, the women still flock to him. I’m serious! The moment Eva (Mina) and Lucia (Lucy) clap eyes on Villarias’s Dracula, they are not shy little wallflowers even when Dracula marvels at the wonder of death and dying. If anything, this morbid talk actually turns Eva and Lucia on, and you can see it in their eyes- the way they gaze at Dracula has the thinly-veiled carnal yearning that the American actresses in Browning’s counterpart could only politely hint at. It is this kind of sexuality that was considered far too inappropriate for American audiences… ironic to say that now, isn’t it? It just goes to show you guys, even if you look like a nuthouse patient, it’s all in the personality. I just can’t with this face. Despite the way I am talking about these bizzare aspects, I’m not saying they are negative at all. 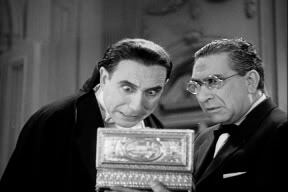 Villarias is a very bizzare actor to watch and he may not have sold the character as well as Lugosi did, the rest of film is highly consistent in keeping atmosphere, style and pacing to a respectable degree. One of the key differences is Melford’s use of the camera is highly dynamic, it is never static for very long, that is to say, that while you still see all of the action, the framing is never the same for very long and it keeps your attention. Another advantage this one boasts is that it’s continuity in character and story line is far more consistent than Browning’s version- the fates and motivations of characters are all recognized and resolved by the time the movie ends. There is something in Villarias’ performance that could almost be seen as a precursor to Gary Oldman’s Count in ‘Bram Stoker’s Dracula’, as in, an unconventional performance that isn’t quite this, and isn’t quite that, but it’s still a fascinating show. While Browning’s version may be the most widely known and culturally relevant to cinema and while Lugosi is still the undisputed portrayal of Dracula in the history of film, Melford’s ‘Dracula’ should not be overlooked. Yes, the inherent insanity of some of the performances may grate nerves, and while you know this film could be construed as a cash-in, to disregard it would almost be unfair. You still are watching a trail that has been blazed by Lugosi, but in this case, it’s a trail that can be easily deviated from which still works admirably. And even if all of this doesn’t endear itself to you, you can at least take great merriment in the faces Villarias pulls. This guy is having the time of his undead life, and who are we to hold that against him? Trivia: Although nobody on either production apparently saw each other during filming, Bela Lugosi was called to stand in for Villarias for one moment in the film in virtually the same pose he did for Browning’s film.